Here is how I configure it now in order to get the best performances for my server and my own usage. Software Raid Array fully independent from the hardware. If a physical controller die, no need to replace it with another identical one. Support adding a disk with existing data into the Software Raid Array. 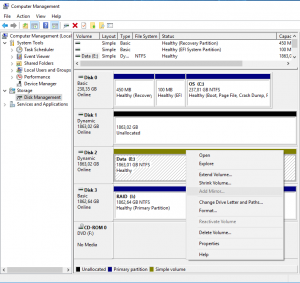 No need to add blank disk as required with hardware raid or with Windows Storage Server. 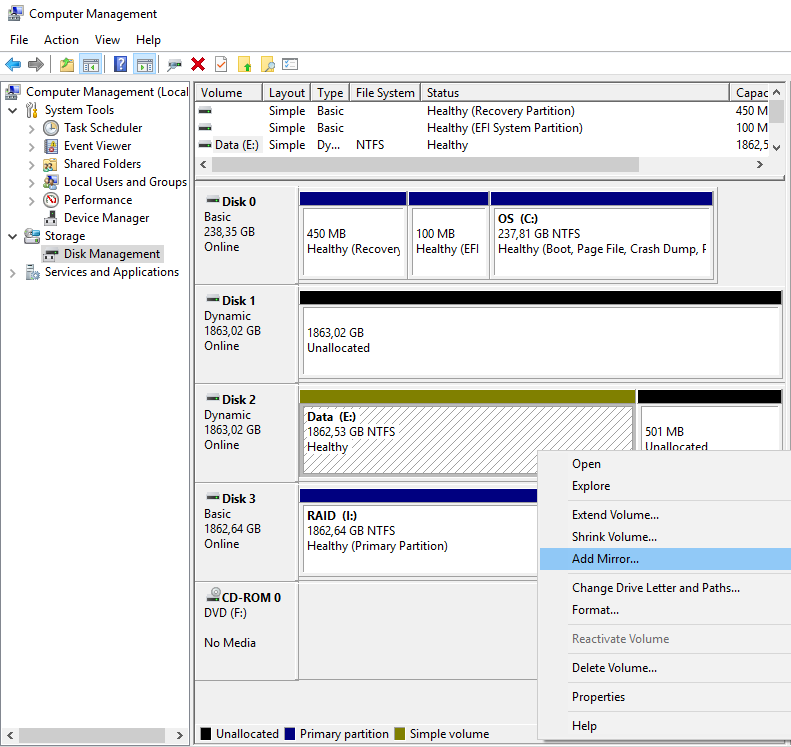 Survive to simultaneous failure of several drives. 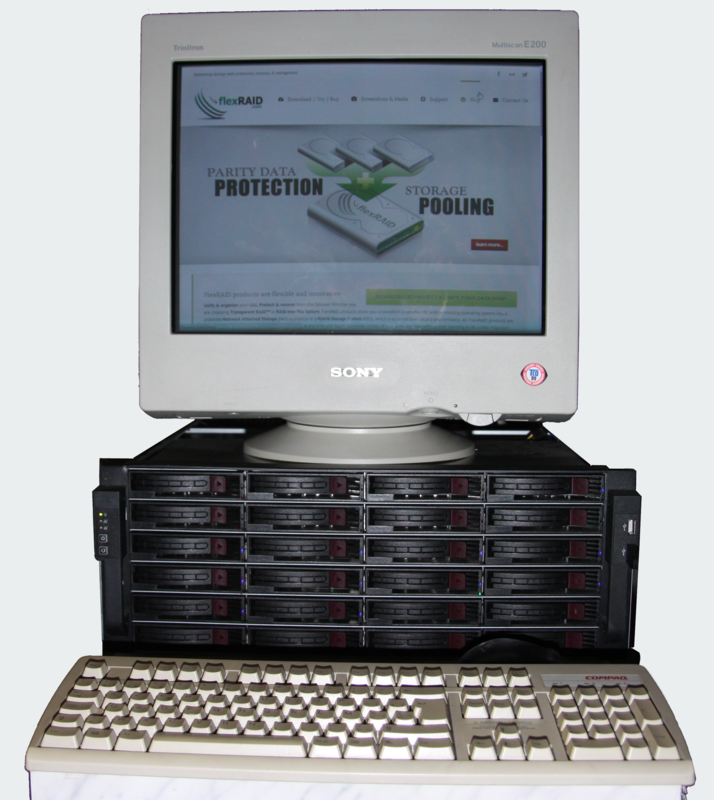 Access each disk through a virtual disk or through a Pool offering a unique/global view on all the virtual disks. It comes with Storage Accelerations. Currently, a "Landing Zone": use of a SSD as a temporary storage. Files copied into the array are dropped onto the SDD and transferred later, in background, to the array. Once Physical Drives "Registered as Pass-Through", to be used as DRU or PPU, and added into a "RAID Configuration (defining hence an "Array"), one can set various options on that "Configuration"
Read-Only Policy=Never. This is the default and authorize writing on all disks in the array, even on disks failing. Scheduled Range Operation Size (in GB)=100. I didn't fine-tune this default value yet (taking into account e.g. how much data can be validated per hours when the server is on). Actually, I turn my server on only a few times per month, to do massive backups. Once the backups completed, I start a complete Validation of the array and configure the system to shutdown on completion. Statistics: File=true, RAID=true. I want indeed to monitor my system. But File Statistics requires a Job to be scheduled for the Storage! Performance Profile=PERFORMANCE. Because my server is only on when I want to do backups, I don't care about saving disks/energy. 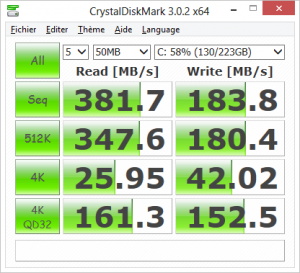 On the opposite, I care about performance and this profile provides indeed noticeable improvements at disk access speed level. Concurrency Queuing (CQ) Depth=64, Salt=16. Salt is use in the algorithm managing "concurrency" within T-RAID. System could experience lock overrides if the salt is too high and constant out of sync blocks if it is too low. The perfect values depends on the hardware... So, as long as "out of sync blocks" are reported during "Verify and Sync" tasks, increase the salt. But look into the "RAID Monitoring" tab for the graphic "Lock Override", if the value is increasing drastically, lower the salt! OS Caching=false. I don't use this one as it doesn't help to keep high performances when copying files larger than the amount of RAM, which is the case for me. In addition, the PERFORMANCE mode is not guarantee to be efficient with "OS Caching"=true when using multiple PPU, which is also the case for me. Tagged Command Queuing (TCQ)=true, Depth=32. I am using this option to improve performances as it's compatible with the PERFORMANCE mode while using multiple PPU. 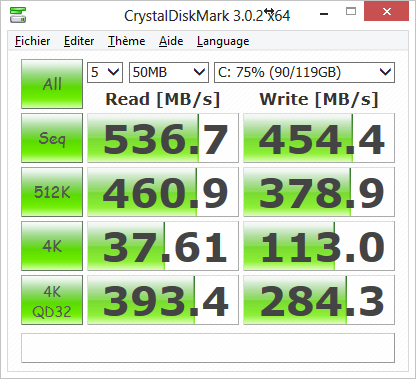 It allow up to 90% of source disk write speed. Sequential Write Optimization (SWO)=true, Depth=8. I keep those default values. Direct I/O=true. I also keep those default values. Removable=false. This settings must be set on false on Windows Server 2012 Essentials. Storage Pool Caching=META_DATA_ONLY, Max=310. I noticed that performances are much better when using this setting instead of File_AND_META_DATA for copy of large files, which is the case for me. Space Management Reserve (in GB)=50. I keep this default. Native NFS Support=false. I keep this default. For each disks on a LSI SAS controller, I have to set an "Advanced Mapping"
For each disks, I also enable SMART Monitoring (every 4 hours) except when disks are in standby. Write performances are a lot impacted by the performances of the PPU. The best disks should be used as PPU instead of DRU. To increase Read Performances, the File Management Strategy has better be ROUN_ROBIN as it enables I/O parallelism. I really try to avoid doing a Defrag as so-far, I am not yet 100% convinced that, on my system, it does not results "blocks out of sync" (I.e. : requires a Verify&Sync). For that reason, I have disabled the automatic-daily-defrag; E.g. 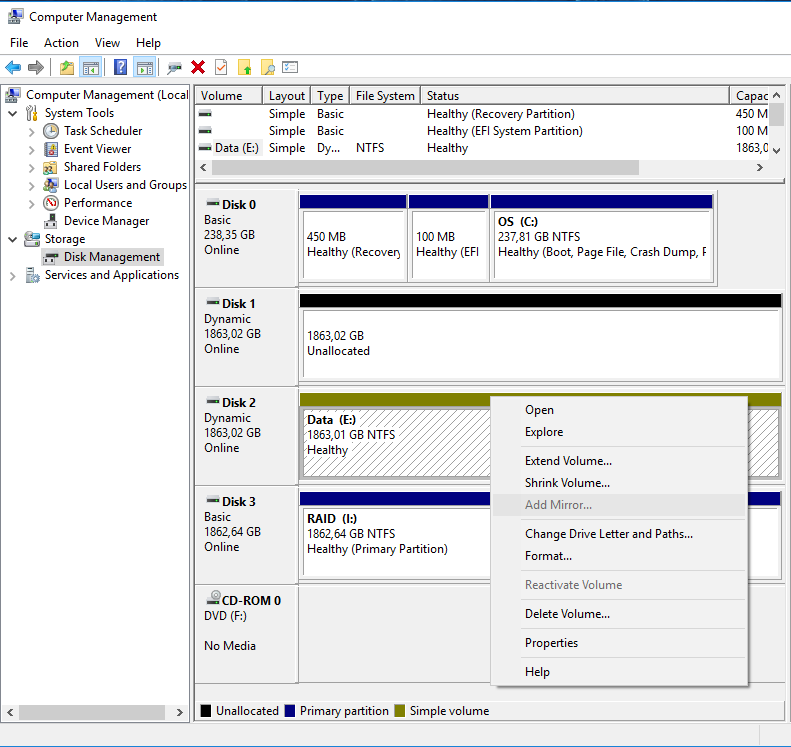 : Turn off the Windows Disk Defragmenter Schedule (See FlexRaid's Wiki) or uncheck the automatic optimization on concerned drives in O&O Defrag. Pay attention that new NZFS disk appearing when the array start can be taken automatically into account by the defrag tool. Defrag, if done, should never be executed on several disk simultaneously (See FlexRaid's wiki). 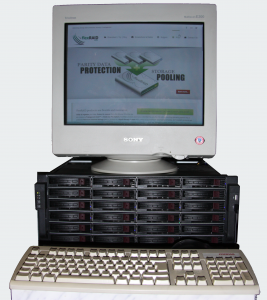 If you do a Defrag, you better stop the Pool or at least imperatively disable "Storage Pool Caching". I didn't succeed to do a Chkdsk on the "NZFS Drives" and had to bring the "Source Drives" online to repair them... Once repaired, a Verify&Sync is mandatory! (NB. : One thing to try is dis-engaging driver protection mode. asit blocks certain low level operations. Unfortunately, it's not recommended to run disk tools on the transparent disks with driver protection dis-engaged). When a Verify task fails, it provides the exact first and last byte failure as well as the amount of 4KB blocks. One can then start an "Range Specific Operation" to Verify&Sync the specified zone. Notice that first/last position of failure is in Bytes while the "Range Specific Operation" can be in KB, MB, etc... 1KB = 1024B). Notice also that the Verify&Sync updates complete blocks (4KB) and will therefore possible report different addresses (first byte of the updated block) than the Verify Task! I have 6 Sata II controllers on my Motherboard "Asus Striker II Formula". They support RAID thanks to the NVidia MediaShield Storage Technology. Yesterday, I plugged into a PCI-e 16x port of this motherboard a Promise FastTrak TX4660 controller card with RAID support. Unfortunately, the initialization sequence of the FastTrak (during the boot sequence) kept blocked forever on the message "Press <Ctrl-F> to enter FastBuild Utility". I was unable to either enter this utility pressing Ctrl-F or continue the boot sequence (and start the OS). And although the PC didn't look completely freezed, Ctrl-Alt-Delete was not responding either. Notice: I was using a PS2 keyboard, just to be sure... as some USB controllers are sometimes not initialized before the end of the boot sequence to make this one shorter. I quickly discovered that the FastTrak was passing successfully if I was disabling the RAID Support on the motherboard. But then, my PC was not able to start the OS as this one was installed on a RAID 0 array managed by the motherboard's controllers. This morning, I read that the Promise FastTrak is incompatible with some other Raid Controllers. I assumed I was in such a case. So, I started to hope that a Bios Update would possibly fix the incompatibility.